Matt McCarten has joined Labour as the leader, David Cunliffe’s, chief of staff. If I hated elections and thought they were just a distraction designed to dupe the poor, then I would be worried cause Matt might just be able to get some of the 800,000 to 1 million non-voters interested in voting again, writes Andrew Tait. But even though elections are an uneven playing field, slanted to the interests of the rich, they are still a playing field. Once every three years, people all through these islands talk politics. Matt is no revolutionary socialist, but if he’s helping plan Labour’s campaign, then it’s a fair bet the kind of politics we’ll be talking will be to the left of normal. This is a step to the right for Matt. The last time he was in Labour was 1989, when he split left with New Labour, which became the Alliance. 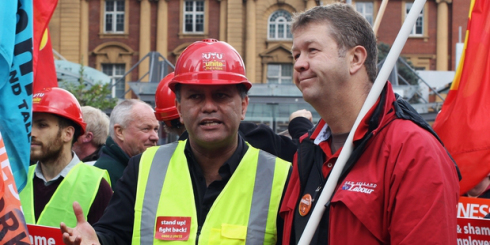 He supported the Maori Party briefly, then Mana, but his main work has been with the Unite trade union. Many on the left will be disappointed to see this lefty track right, but the fact of the matter is that Matt McCarten is a good guy, but a rogue, a reformist and an opportunist. If he sees his wheeling and dealing can spin things to the left, to the benefit of his people, then he’ll seize it. Matt’s a rare bird – an opportunist who is not out to make money. He could have sold out for a pretty penny at any stage of his career. The man could be sitting on the Waitangi Tribunal or schmoozing with petro-execs. Instead he’s dedicated his life to the working class. I’ve not spent a great deal of time with the man, mainly at Unite union conferences but what struck me there, and the highest compliment I can pay is that he wants the respect of the hotel cleaners and fast food workers in his union. That he wants the respect of working people – there can be no greater contrast with the Labour Party. What sickens both Labour’s enemies and friends is their hypocrisy. The stench of the “born to rule” clings to them like eau-de-cologne. At least the National Party MPs revel in being a “cut above” the working class. They are either the children of the Khandallah mansions or class traitors, the scumbags who have swallowed, hook, line and sinker, the bait offered by the rich – money and praise – to pick up a whip and join the establishment. Labour MPs feel the same but can’t revel in it. They feel special, either born to wealth or with wealth thrust upon them. They have been to Ivy League universities, have run corporations, they were head prefects at high school. This serves them well when rubbing shoulders at the UN (Grant Robertson) or petro-chemical conferences (Shane Jones) or even just hanging out with “Kiwi creatives” like the Scab-lord Peter Jackson. But tediously enough at election time they have to go back to their constituencies and talk to the proles. What a drag! A couple of years ago South Dunedin MP Clare Curran went for a walk in her electorate and – shock horror – discovered people were living in poverty! These are the kind of unpleasant surprises that lie in wait for the tender intelligences of the Labour Party’s finest. But not for Matt McCarten. This is where he came from, and this is where he has spent his working life. If anyone can chart a course to the left, map a campaign where Labour can regain some of the 1 million missing votes, it’s Matt. Matt won’t bring any political vision to Labour. He is a campaigner, a strategist and a horse-trader but first principles are foreign to him. He has no philosophy or political vision, at least not one he can articulate or share. Behind closed doors with the far left, he quotes Lenin. Who knows who he quotes when he’s closeted with bosses or right-wing Labour MPs? In losing Matt, Mana loses little in the way of ideas and gains a lot by way of strategic advantage. If Labour can create an interest in the elections, it will be to Mana’s gain. Our competition in this election is not the Labour Party or the Greens. It is disillusionment with voting itself. Eighty percent of young Maori did not vote in the last election – that is Mana’s natural constituency. But Mana does not have the machine to run a campaign large enough to make a dent in public consciousness. The Labour Party does. Any attempt to bring non-voters back is risky. These are people who are not interested in business as usual. If Labour wants them on board, they will have to try some exciting tricks. If nothing else, Matt should make for a more entertaining election.